The Big Bunny and more hoppity haps are going down the slopes. North Lake Tahoe is hopping for Easter. 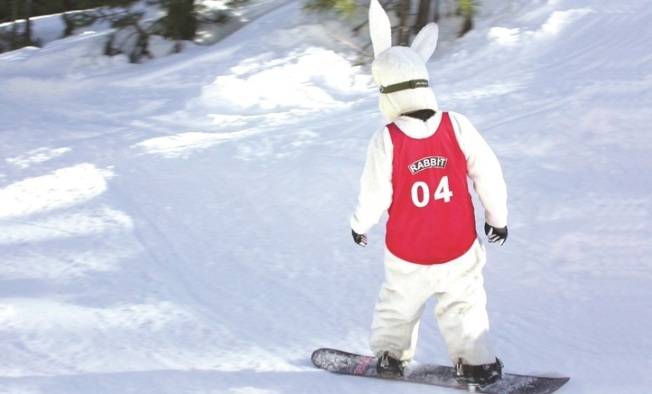 Did you just see that rabbit snowboarding at Northstar? Yeah, we thought we did, too. IT ISN'T ALL THE UNUSUAL... to spy a busy rabbit hopping about deep within a grove of pines. Nor is coming across some tracks during a snowshoe through the woods out of the ordinary at all. But spying a tall, long-of-ear fellow jet by you on a snowboard? That definitely could be cause for comment, maybe a shout-out to your nearby pals to see if they saw the giant rabbit, too. Unless, of course, you're spending Easter weekend around North Tahoe. It's technically spring, yes, but there's frosty stuff about, meaning the springtime holiday meets the winter-style slopes action in a very visual way: The Easter Bunny skis from 10 a.m. to 2 p.m. on Eastery Sunday at Northstar. There are Easter Bunny photos to be had to (which leads one to ponder how many people are dressed in sweaters and knit caps for this springtime snapshot-y ritual overall -- probably not many). The Village Rink is the site of an Easter egg dash at 10:30 a.m. and a parade marches later in the afternoon on April 5, at 4:45 p.m.
EASTER BY THE LAKE: There are several hoppity doings going down at resorts and restaurants in the Tahoe region, from a pair of Easter egg hunts at West Shore (if you're hoping one of those is for the grown-ups, you're in luck) to a plated brunch at River Ranch Lodge & Restaurant. Lone Eagle Grille at the Hyatt Regency Lake Tahoe and Gar Woods will also be going the special holiday meal route. As for more merriment around the shore? The North Lake Tahoe Facebook page has some suggestions. And, for sure, spring skiing is still afoot at a number of lake-close destinations well into April, in case you'd rather go the fleece-and-goggles route over the flowery bonnet-and-sundress plan of spring holidays of the past. But it isn't all about going downhill at amazing speeds; the North Lake Tahoe site does devote some thought to hottubbing prospects, too. Cheers to that.